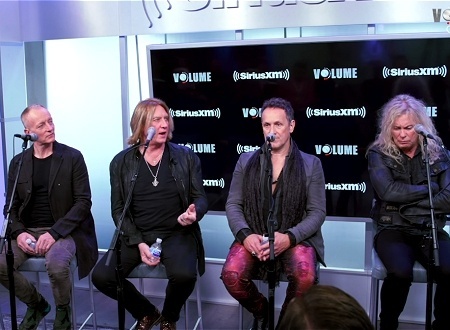 All five members of Def Leppard appeared on the Sirius XM Volume show Town Hall last night with audio and video available. 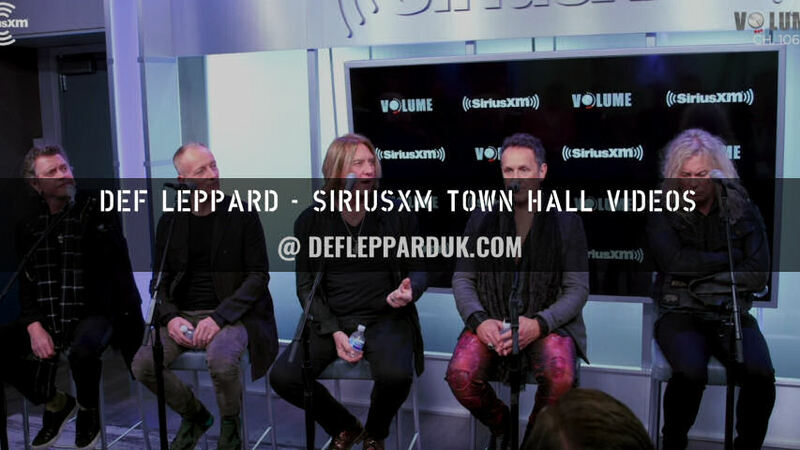 The full band spoke to David Fricke for the 'Town Hall: Def Leppard' live radio special for Sirius XM radio. They were promoting tonight's Rock And Roll Hall Of Fame Induction ceremony which is now just a few hours away. They talked about the Rock And Roll Hall Of Fame Induction, early years, being a working band, parental influence, Animal instinct Book/Joe's memorabilia, the band name, Atomic Mass, Rick Allen joining the band, Phil/Vivian's Def Leppard Memories Before Joining, Early Tours/Pyromania Tour, Union Jack Shirts/Shorts Merchandise, Most/Least Favourite Promo Videos/PSSOM, Steve Clark's Death/Success, Rick Allen's Recovery, Vivian Joining The Band, Hewey Lucas/Steve Clark's Live Vocals, Vivian/Mutt Lange Vocals, Technology Changes In Music Industry, Live Band Sound, Band Vocal Influence On Other Artists, Influence On Pop Artists, Advice For Emerging Artists, Advice From Older Artists/Ian Hunter, Making A New Album/Solo Albums, Self-Ttiled Def Leppard Album and Hysteria Album Recording. Phil and Joe spoke briefly near the end about their band's next studio album. Listen to the full one hour interview via the radio link below and a media photo courtesy of Gettyimages. Watch any video footage via the YouTube playlist link. 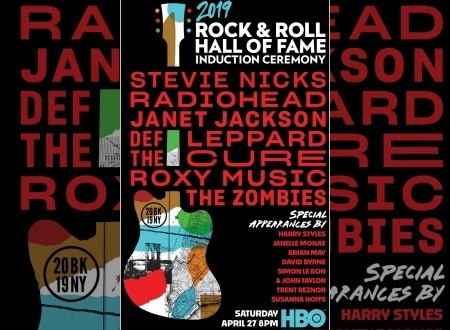 The 34th annual Rock And Roll Hall Of Fame Induction takes place on tonight at Barclays Center in Brooklyn, NY. Follow the live updates. Sav - "That's probably the most important thing for us or me personally. Is joining a club where there's people in this club that you really were inspired by. Well we still kinda are. It's just the way we are." What did you want to achieve at the start? Joe - "Well it was nothing to do with any hall of fame because like you said there wasn't one. In fact even when it came about we didn't know about it you know. When we started out all we wanted to do was emulate everything that we knew you know. You're a kid and you hear music, you love music. If you're lucky you might get a guitar or a drumkit for Christmas 'cause you wanna learn to play. So then what are you gonna do?. You're gonna copy stuff that you like and learn to play so there's your influences right there." Joe - "So our early influences would have been all the early 60s. Stones, Beatles, Humble Pie, The Who. That kinda stuff that came through. You know even The Move. And even the pop stuff. Herman's Hermits for god's sake. Whatever you know. And then you move into the 70s and things went into colour and then we had T. Rex and Bowie and Slade and Sweet. And we would, you know, we would buy their singles. We couldn't afford albums half the time but we'd buy their singles." Joe - "So you build this little collection of songs in your mind and in your shelf in your bedroom and that was basically the embryonic beginning of the band for me. And again everyone's got their own story but we all meet in the middle at some point. And all that lot is the history and that's all we were trying to emulate was to be like everything that we heard." Phil - "We're making a record. We actually never stop. We're constantly recording. We actually was doing some stuff last year. And we're sending stuff around so yeah we'll see." Joe - "Def Leppard haven't made a record, he has (Vivian), he has (Phil) and I have. Individually, you know, side projects." Phil - "But we are working on it. We've got stuff floating around between us." Joe - "We're in here - there's always songs. We've been working on an idea of Phil's that he's had for ages that I kind of keep nudging him going: 'Dig that one out 'cause I think it could work'. We're constantly doing that."